1.Finely sewn plaid bordered,classic and chic. Perfect for any size tree. 2.This Beautifully tree skirt will add more holiday atmosphere to your Christmas tree and home décor. 3.Two velcros at the opening allow you to secure tree skirt in place underneath the Christmas tree; folds neatly to store with Christmas decorations. 4.This tree skirt measures is sewn and made from burlap blend complete with a ruffle made from the red and black plaid flannel. ★ Rustic style farmhouse tree skirt features a delicate red and black plaid ruffle edge, imitated linen burlap blended with cotton plaid edge, 2018 new popular trend! ★ The Hook & Loop feature which made it easier to put around the christmas tree, plus our unique 2pcs bowknot decorated, very pretty and practical. 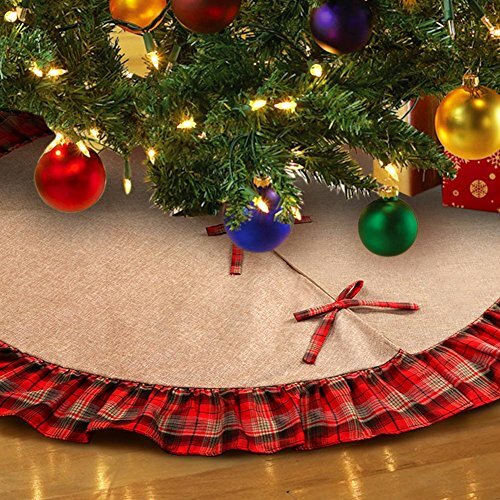 ★ The plaid design and pastoral style tree skirt will add more holiday atmosphere to your Christmas tree and perfect for home outdoor indoor decorations. ★ Durable and lightweight, easy to place it on anywhere you like, such as living room, bedroom, garden, bar, hotel, supermarket or somewhere else. ★ Outer diameter is 48 inches, you can put more things you want on it. Inner diameter is 4inchs, most trees can get through the hole. If you have any questions about this product by Aytai, contact us by completing and submitting the form below. If you are looking for a specif part number, please include it with your message.